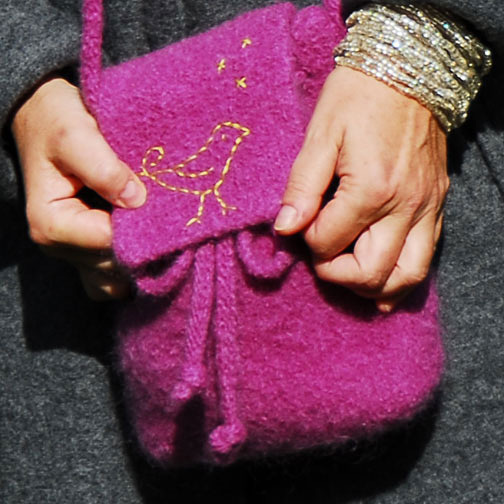 When it comes to my addiction to all things textilicious… my love of felted bags is second only to scarves! I cringe when I admit… I stopped counting my “felted friends” years ago. The idea for this little day caddy came to me in line for coffee. The cavernous tote I had grabbed that morning--- yes, felted--- refused to surrender my wallet! Well, my lovelies, the Mother of Invention is a knitter! This pouch is a perfect fit for my simple daily needs: wallet, keys, glasses, lipstick, iPod, small notebook and pen! All necessities are safely kept in place by a prettily gathered drawstring top and sweetly stitched flap. For stitching ideas, I found great inspiration by flipping through Aimee Ray’s book, Doodle Stitching [Lark Books, 2007]. This felting project is super quick and easy to whip up. This Holiday Season, I just might be merrily crafting an entire flock for those on my gift list…. Work in stockinette st until work measures 15 inches, ending with a WS row. Eyelet Row [RS]: K13, [yo, k2tog, k7] seven times, yo, k2tog, k12. Work 5 rows in stockinette st, beginning with a WS row. BO all sts. Work in stockinette st until work measures 6.5 inches. Work in stockinette st until work measures 60 inches. CO 94 sts. BO all sts. Sew together side edges of bag piece, forming a tube. 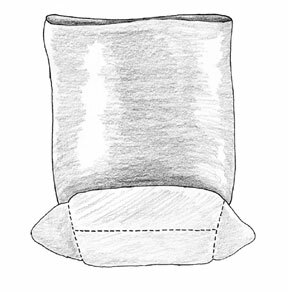 Centering seam at what will become the back of the bag, sew CO edge together, forming a flat pocket. With bag inside out, flatten bag bottom --> so that the middle of the base seam is centered and faces up. Sew a seam across each corner, forming triangular 'ears'. Fold these ears toward center of bag base and lightly sew in place. Loosely thread non-felting yarn through eyelets at top of bag, and knot ends together. Place all pieces in a net laundry bag. Add a small amount of mild detergent and run through washer cycle set for small load with hot wash and cold rinse. For added agitation, you may wish to add an old pair of jeans or towel to the mix. Stop the washer periodically to check the progress of the felting. Run additional cycles if necessary to achieve desired size and density. 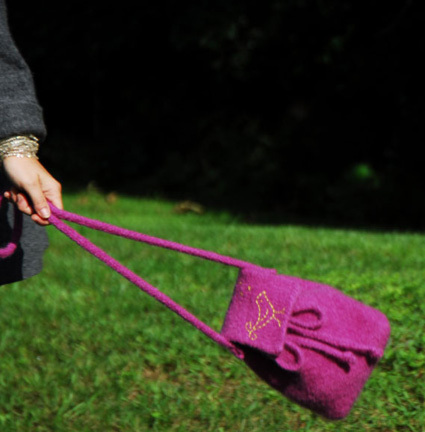 Bag shown was felted until stitches were no longer visible. When pieces are felted, remove from washer, rinse if necessary, pull into shape and lay flat to dry. Using embroidery floss and needle and referring to photo as a guide, work stitching on flap as desired. 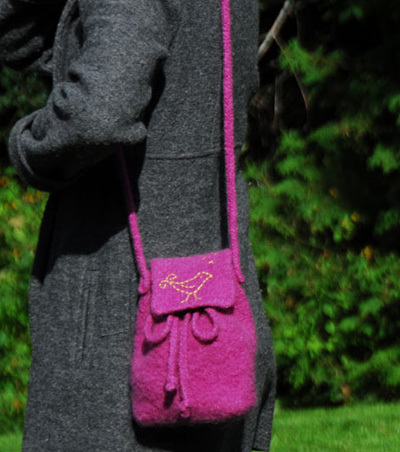 Use backstitch --> to attach flap to back of bag, centered between drawstring holes. Knot one end of each drawstring. Beginning at edge of flap, thread un-knotted end of first drawstring through four eyelets towards center front of bag. Repeat with second drawstring. 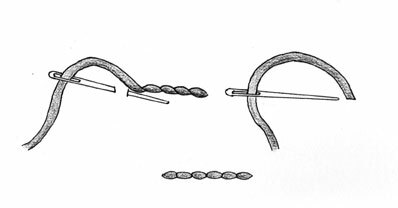 Knot ends, trimming if necessary. Use pins to attach strap to bag, centered between first and second eyelets on each side (counting forward from flap). Try on bag, and trim to adjust strap length as necessary. Stitch strap firmly to bag. Mags Kandis is a writer of books, designer of things and maker of stuff. You can keep up with her comings and goings on her blog.